Call me crazy but I love to vacuum. Its a simple way to make the house look clean and be clean! My son used to find the sound of the vacuum soothing. He would smile at it and wave to it as I cleaned. But now oh my he is terrified of it. He screams and cries anytime I turn it on, its very sad. I knew I needed to find a new solution to vacuuming without a big bulky corded vacuum. I was sent a Rowenta Delta Force 18V Cordless Stick Vac to review for the Holidays. This vacuum came in handy so many times! Its cordless (awesome!) light weight and has a small plug in to charge it, no bulky charge base. Its quick and easy to use. We vacuumed up cookie crumbs from Santa and confetti from New Years celebrations with ease. We have short carpet and hardwood flooring for the two settings on the vacuum but I think if we had high pile carpet it might not get the deep dirt as much. Definitely a good maintenance vacuum. I liked the easy empty push button to open the canister and the heavy duty filtration system. I plan to use this vacuum exclusively in my sons room so he can have the least amount of dust possible. My son still is a bit apprehensive about it but does not scream since it seems more like a loud broom to him. The corner shaped head of the vacuum made it easier to get into corners and edges. Its a bit expensive but the quality is there for the asking price. I have had stick vacuums before and none compare to power of this one. I do not think it could replace a big vacuum in a large house especially when you have kids and pets like I do but its great for maintenance and quick clean ups. I am happy to not have to drag out our big vacuum and the cord all over the house when I plan to do regular vacuuming. 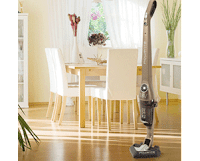 Rowenta Delta Force cordless rechargeable stick vacuum runs for up to 40 minutes on a single charge. Two settings adjust for hard floors and carpeting, and the unique swivel-triangle head edges into corners and along walls with precision. Cordless rechargeable stick vacuum runs for up to 40 minutes on a single charge. Ideal for hard floors, area rugs and low- to medium-pile carpet. Triangular motorized suction head swivels to reach into corners and awkward spaces. Slim profile for easy storage in pantry or closet. Charger plugs directly into self-standing unit; no external charging stand. 16-hour charge time. *I was not paid or compensated for this post. The opinions in this post are 100% mine. I was provided the product pictured to review for this post by the Company / PR Company.